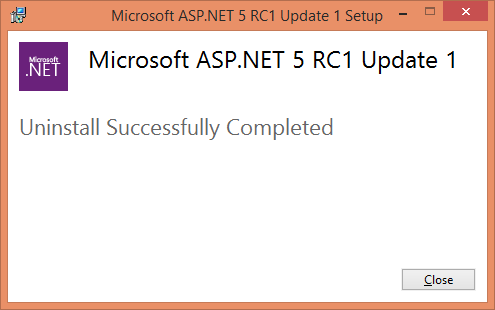 If you are tracking the progress of ASP.NET Core 1.0 (formerly ASP.NET 5) you are probably aware that Microsoft has announced the availability of RC2. You can read detailed announcement here. This article aims at providing detailed instructions about installing the RC2 bits. 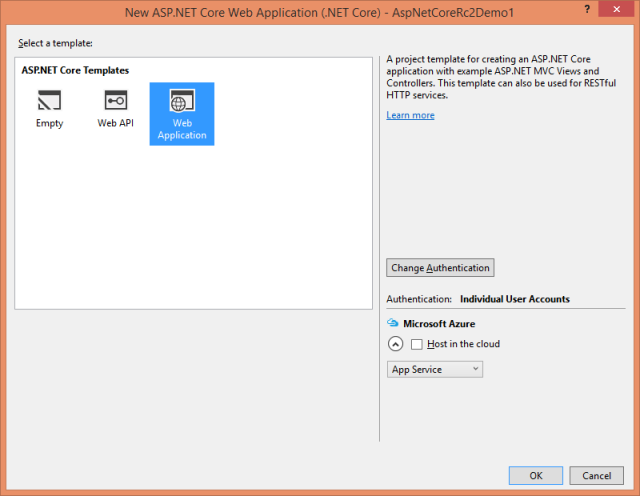 Moreover, it quickly walks you through creating "Hello ASP.NET Core" web application. This step is applicable only if you are currently running RC1 bits on your machine. If so, you need to uninstall ASP.NET RC1 first. 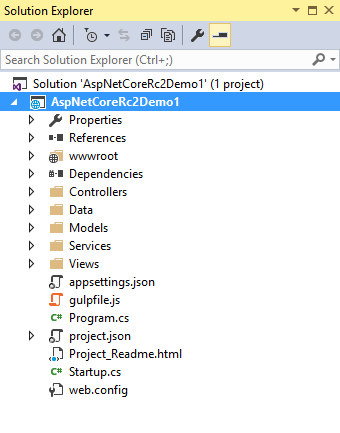 Go to Add / Remove programs and locate ASP.NET RC1 entry to uninstall it. I faced a tricky issue while uninstalling RC1 bits - the uninstaller asked for the original setup installable. So, you may consider having it ready with you. You can download the RC1 installer here. You can now install RC2 bits by following any of the ways outlined here. If you are a Visual Studio 2015 uses you have an easy way to install RC2 by running the Visual Studio 2015 MSI installer found here. 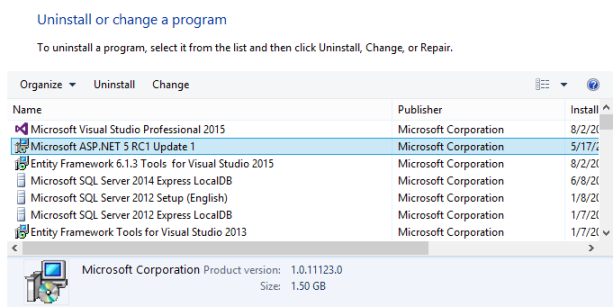 Note that the Visual Studio MSI installer requires that you have Visual Studio 2015 Update 2 installed. So, make sure to update your Visual Studio 2015 to Update 2. The Update 2 can be found here. The following figure shows the launching window of the MSI installer. As you can see there are three entries now. 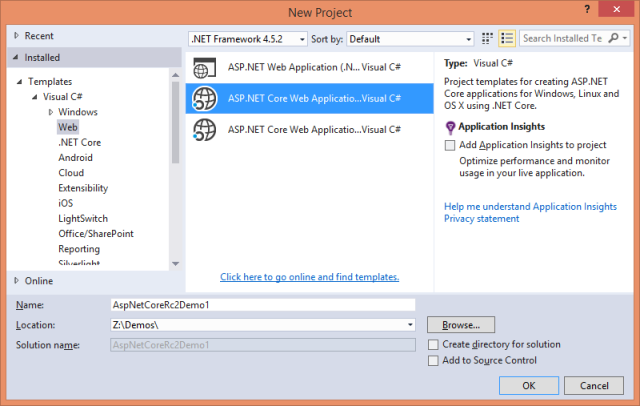 The second and the third entries are for ASP.NET Core applications (depending on the target framework). Let's select the second entry that targets .NET Core 1.0. Select Web Application and click OK to create the project. Now that the project is created, have a look at the Solution Explorer. Although I am not going to enumerate the changes in this article you can read more about migrating RC1 applications to RC2 here. There is web.config added in the project root. The Main() method is now moved inside Program.cs to make it inline with Console applications. 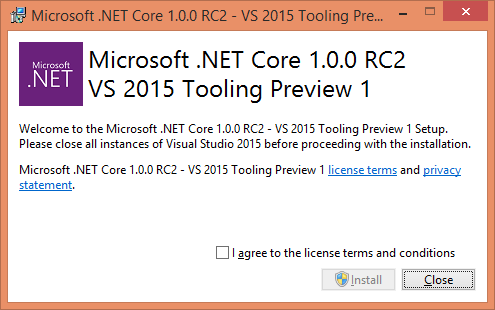 Here, you simply set a Message property on the ViewBag to "Hello ASP.NET Core RC2 !!!". For this simple application this is what we want. So, enter t he above markup and save the Index view. That's it! 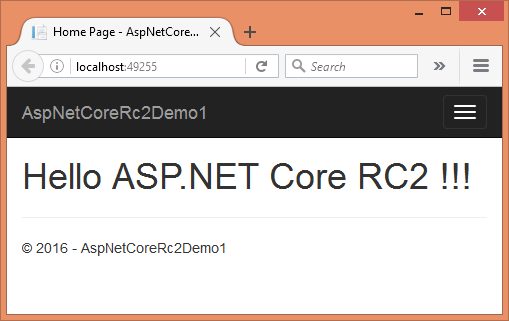 You just successfully installed ASP.NET Core RC2 and also developed a simple "Hello ASP.NET Core" application ! !